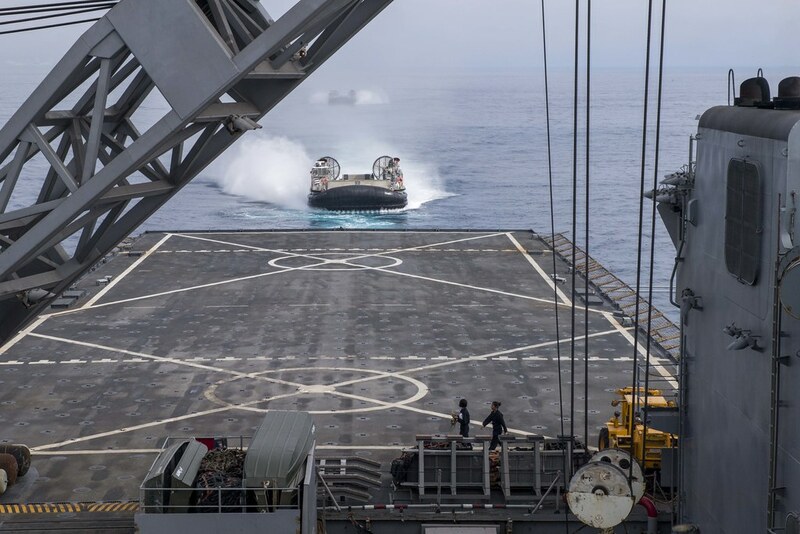 SAN DIEGO - The Whidbey Island-class dock landing ship USS Rushmore (LSD 47), with elements from 11th Marine Expeditionary Unit and the Japan Ground Self-Defense Force, concluded exercise Iron Fist 2018 off the coast of Southern California, Feb. 7. Iron Fist 2018 demonstrated more than a decade of interoperability development and enhanced amphibious capability of Japanese and American forces. Rushmore provided both an amphibious and air platform for U.S. Marine Corps and Japanese Ground Self-Defense Force members to train and conduct operations. The amphibious phase of Iron Fist 2018 showed that Rushmore was able to act as a single focal point for surface, air and amphibious operations, while nearly 300 U.S. Marines and Japanese personnel joined more than 330 Sailors aboard. During the five-day exercise, Rushmore launched six amphibious assault vehicles numerous times from its well deck and conducted over 20 flight deck landings. The culminating training event was a scenario-based amphibious assault launched from Rushmore in coordination with an inland helicopter assault. The exercise wrapped up with the components of 11th MEU and Japanese Maritime and Ground Self-Defense Forces departing the ship and returning to Camp Pendleton. Joint interagency and international relationships strengthen U.S. Third Fleet's ability to respond quickly and effectively to crises that occur in the Pacific. The Japan-U.S. alliance helps with counter-terrorism, counter-piracy, peacekeeping, capacity building, ballistic missile defense, and humanitarian assistance/disaster relief. U.S. 3rd Fleet leads naval forces in the Pacific and provides the realistic, relevant training necessary for an effective global Navy. Third Fleet constantly coordinates with U.S. 7th Fleet to plan and execute missions that promote ongoing peace, security, and stability throughout the Pacific.